I’m considering using Meteor to build some new commercial software for the retail industry. Firstly, I wanted to say hello, as I expect I’ll be here a lot. Considering my future goals of this project, with multiple products contained within a larger solution, I’m thinking Angular might be the best choice of front-end framework. From what I’ve read, it is more structured than React and Blaze, but is the most difficult to learn. However, I’ve used none of these before. Are the future benefits worth learning Angular, or should I start with React? How hard is it to migrate from one to another? What version(s) of Angular does Meteor (Angular-Meteor) support? If I have to learn something from scratch, I may as well start with the latest version but is v4 supported, and if not, is there a plan for that? Bootstrap seems the best choice for styling the UI. It’s widely used, well backed, and seems relatively easy to learn. The components also have the kind of look I’m seeking for the app. How well does it work with Meteor, either with Angular or React? Does it work out-of-the-box, or do I need third-party modules? That’s about it for now. Any feedback gratefully received. https://github.com/meteor-vue/ would be a good place to start. These two main architectural decisions should get you to an mvp quicker and with a lot less pain. Thanks for the reply. I’ll look into Vue. I’ve seen it mentioned but hadn’t really looked into it because the docs say that Meteor officially supports Blaze, Angular and React. I’m a little hesitant to make a decision to go with something that isn’t officially supported. I know you could say that when we use any open source module we’re doing that all the time, so it shouldn’t be an issue so long as the community using it is big enough. However, for such a significant architectural decision, and especially for a noob, official gives a warm and fuzzy feeling… Maybe I’m being over-cautious? I believe best engineering/architectural decisions are the ones that best fit your usecase, not some bluebook recommendation. Now, whether you like it or not, whatever you build as an mvp now is very highly liekly to be thrown away when you decide it is time to build a robust, production quality product. This is not only because of the formal technical quality of what you’ll have build, but also because the market will have given you lots of feedback that should call for some big changes anyway. Go with a toolset and architecture that is “just about” sufficient, powerful, easy and mature for your use case, which I believe is meteor and vue. Now had you been more experienced, working with external developers, already tried these alternatives elsewhere, a debate would have made sense, but now, that debate is chipping away from valuable time you could have used for building your mvp. Then when you’re ready to build the full blown product in hopefully the near future, I promise I’ll surprize you with a drastically different suggestion, geared towards your needs at the time. Thanks for your detailed response! All very valid points. What is your opinion on the fact that Vue is not “officially” supported though? Does that mean less examples, smaller community, potential issues with new Meteor releases, etc? Since I’ll likely be learning by example much of the time, I see this as a potential issue. I don’t want to be spending my time fixing something that Meteor would have otherwise addressed for a supported framework/library. Maybe I’m missing something, but from what I’ve seen on the surface React doesn’t look too complicated. As for very little experience, that is true for these technologies, but I have an undergraduate degree in computer science and have build and sold a software startup before. I’m not starting from complete scratch. I’d value your input on whether any of this changes your suggestion. I totally agree with going for Meteor’s data system (minimongo, tracker based, meteor’s user system, etc). I don’t entirely agree with choosing a ‘lesser’ tool for the job, because of the ‘its going to be rebuild by experienced people when its time to hire them’. Let me make clear though that Vue is not better or worse then React, Blaze or Angular. They are different flavors, with similar ways of developing (component based). Go with the tools you are most comfortable with and really stick to standards. No custom stuff at all. Lucky as you are, Meteor is supporting 3 UI frameworks. Blaze, React and Angular. However, support in Meteor’s case means actively documented. Meteor works with any UI framework abd Vue is the best example of it! It has already a wide community and is seen as the result of React and Angular having a child. (Read, shares flavours of both). It also has a wide community and like React its growing in popularity (a lot). This means that it might be easier to hire people later on with Vue experience. Thanks for your input, @cloudspider. I do agree with @serkandurusoy that the new dev team may well toss everything out and start again. That happened to me before, when I built a MVP in Perl (we’re talking back in '98 here! ), and that was later replaced by Java. It was the right decision. We didn’t know how big the product would get when we prototyped it in Perl as a one-customer solution. However, tossing everything out and starting again was expensive in terms of time and money. Although the lean startup methodology does promote getting an MVP as fast as possible, it also promotes continuous deployment. If you’re going back to square one, that’s not so lean. Better, in my opinion to work smarter and try to avoid it. If it’s necessary then that’s what should be done. If you can avoid it, you just saved some valuable time and money. The github stars clear show an astonishing amount of interest in Vue, that looks to catch up with React pretty soon. However, the NPM downloads still suggest a huge difference between actual use of Vue and React. Hence, my thinking regarding hiring developers and in finding online resources and libraries. I would like to begin with clarifying against @cloudspider’s comment and say that I definitely am not suggesting a “lesser” tool, in fact I am suggesting vue because I think it is a better tool for you for the reasons I’ve listed. Otherwise, all these ui frameworks/libraries are, again as he said, equally powerful and offer almost the same featureset where it may be easier to do one thing with one than the other but mind you there’s no magic wand out there that’s great on all aspects. It all boils down to experience and preference. That brings me to my conclusion; you don’t have the experience, nor a preference (yet) for a ui framework. But looking at other people’s experience, especially people who come from mostly server side “non enterprise web” stacks (php, perl, ruby) with some templating language experience, it looks like - based on statistics - that vue is going to get you from zero to mvp much faster. But since it is also a very powerful alternative with a very vibrant community, the odds are you are going to continue with it and reuse parts of your ui codebase for the next iteration of your product. By the way, I prefer react for my development because I am very experienced with it and know how to both quickly build stuff and architect a future proof codebase. I also happen to believe that the corporate backing is a good thing. But these are all opinions. Just the other day, I was discussing a similar topic with a ceo planning to rebuild their product from scratch. They wanted to use vue and are recruiting. What I said was “get react developers to build your project with vue” because a good share of people who develop and become highly productive with vue have been using vue as their first library. They might kind of lack why vue was created and in what ways it might be better/worse for a specific task etc, but the ultimate reality is, they have become productive with it in no time. That’s vue’s main focus, developer experience. Now coming back to the “official” word. I think it is one of meteor’s main pain points in communicating what it is. It just happens that, blaze, angular and react have been documented by mdg (company behind meteor) and they have also released some tools and utilities around them, but they are so small or simple that there’s not much that differentiate those utilities from their community counterparts. In fact, that’s how angular and react entered the meteor ecosystem in the first place. At this point, MDG’s official stance is to encourage the community to build utilities, documentation and governance around these new ui frameworks and they (imho rightfully) don’t want to maintain all of them themselves “officially” because there really is no extra value that they can provide. As for the vue-meteor community, they are quite good in what they are doing. You’ll very soon realize that the meteor-integration is such a thin layer that you’ll even forget it is there and you’ll spend most of your time going over general vue docs, tutorials etc. By the way, these arguments can all be repeated with the data system. I’ve advised that you stick with meteor’s built-in data system with publications and methods and mongo whereas I could have advised you to go with apollo, or something else entirely. But the reality is, the built-in data system is going to make your life so much easier, getting out of your way, solving many problems for you so that you can build your mvp. Don’t get me wrong, it will also get you up to some quite large scale, too, if you architect those building blocks correctly. And lastly, again, stop burning rubber thinking about these, pick the tools and release the brakes. Come back and ask more questions, this time for features of your app, parts of your codebase, begin building so that we can help you build! The crux of your suggestion to go Vue seems to be the time it will take to get to an MVP. That is very important to me, but so is getting from MVP to the next stage with minimal backtracking. If I understand correctly, you have chosen to stay with React partly because you’re very familiar with it (plus the corporate backing opinion, which I agree with). From the valuable knowledge that you are sharing, I have to assume that you’re pretty familiar with Vue also. Yet, you are choosing to use React. So, I’m inferring that you believe that, for larger projects with more developers (which is where I’m going to be in one year), the extra effort to use React is worth it. Is this a fair conclusion? It’s a pleasure to discuss these with you because I believe there are lots of things to learn from different perspectives here. Now my react preferences is mainly due to my react experience and the productivity edge that vue offers does not really translate to much for me. For a lot of developers who are experience with react, vue’s edge is still so tangible that they prefer to switch to it as their preferred library. But for you, that edge will probably be “the” defining quality. Furthermore, lots of huge companies and big name products have switched to vue or adapted it for parts of their offerings. That means it is also scale-ready. 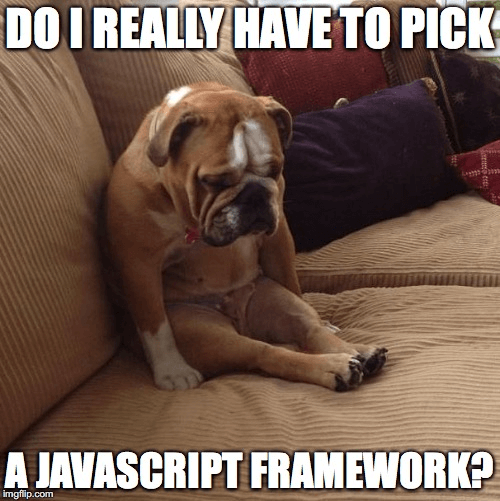 Why don’t you give them each a shot, spare a day to test vue and react by following some video-tutorials to see which one matches your stylistic preferences. The odds are, your first impression is going to stick for 80% of the things you’ll be doing on your ui codebase. And as for the remaining 20%, they would probably be equally painful with either choice. Saving some time and headache from that 80% could help you ease yourself into the problems of the 20%. Also, ‘paralysis by analysis’ is a thing. I’m sure we’ve all suffered from it. So to ease your mind a little I’d say that as long as you pick either Vue or React, you just cannot go wrong at the moment. Above I have assumed you’re looking to target mainly the web. If you wish to target mobile platforms and do so more or less natively, then react-native is probably the best bet right now. Thanks @serkandurusoy and @vooteles for your continued input. I thought I’d give a quick update. I’ve chosen to take a 32 hour video course that covers Meteor and React from scratch, and is aimed at someone with only basic JS knowledge. I then intend to watch a shorter course on Vue to appreciate the differences, and decide between the two. To feel comfortable with the decision, I think I need to take a look myself. I decided to start with React for two reasons. First, if it is the hardest of the two to pick up then by going in deeper I should get a feel for the reasons why, and whether it could be a barrier. Second, I took a look at available courses that fit my style of learning and I found one that seemed to be a perfect fit and which was very well reviewed. It cost around $15 as a first-time Udemy customer, but that’s money well invested for a cohesive 32-hour course vs. a number of shorter free courses (I’m sure there are plenty available, and for Vue too, but I happened to find this first and want to avoid further stalling!). I’ll try to remember to drop back into this thread and provide a final update when I’ve finished my training and compared with Vue (feel free to remind me if I forget!). My React-Learning Journey is a rather very old post (almost 2 years) and a lot has changed and evolved since then, but it might still be relevant, especially since some of the links provided in there have been kept up to date. I also commend you for your willingness into formally investing time into learning the “arguably” harder option, if anything you will have gained a good sense of proper architectures and code structuring which you can still translate to other frameworks and libraries. Thanks @serkandurusoy. I’ll take a look and review some of the resources you list there. Redux is something I’ve already decided that I should probably look into. Which brings me back to your point on structure and architecture. I think this is important to try to get it right from the start, if you have a feel for how complex your project may get (while trying not to over-engineer it, of course). I think this could be a reason why my gut feeling is tending towards React. My project has the potential to have many add-on feature sets, released sequentially once prior feature-sets are being used commerically. Thus, modularity is important. I may be completely wrong, but React seems more structured, in which case this could enforce a better architecture from day one. Fair? Touching on something that @vooteles mentioned, my project will also target mobile platforms eventually. This isn’t a first release requirement, but as the project grows, mobile access (for a subset of features, at least) will definitely come to the fore. Does this shift the balance further in favor of React, I wonder? I’ve got a similar background to yours, and have been tooling around with Meteor as a possibility for some in-house apps. (Right now we’re using a motley collection of tools like Google Drive, QuickBooks and Zoho, but I’m finding it harder to manage as we grow.) Curious to know what you end up using. I found it easier to get going Vue than React, Angular or even Blaze. The devtools and documentation for Vue are very good. Haven’t progressed beyond simple apps, but I’d be very confident selecting Vue as my view layer framework and being able to hire developers who can get up to speed with it quickly. what I found best to work with is Meteor + React + Redux. When you learn React you’ve pretty much covered React Native too so it like a 2 in one and the support for both is huge. Redux is amazing for controlling states (not to replace the Meteor data pipeline). Example: if you have a chat in your app and a user has multiple contacts, you can send a URL which can: pop up the chat on the screen, open the conversation with a particular friend and add a short message. As you go through Meteor, every time you see a Session.get/set think of it as a definition at the top layer of the app and that would be Redux. Every time you feel like you need to go up and down and sidewise with some variables, functions, that is where Redux comes into place. If your app grows larger and you need to tap into a large DB (or more) of some client or partner… add Apollo and the Apollo client will read/write pretty much everything and … eventually in a reactive way. Bootstrap reached V4. You can add it as a library or as React components with some Reactstrap. This was my experience so far. I uploaded for you a sample of Redux log from one of my mobile projects where I have a lot of UX flows that needs to be controlled granularely. @pdrhound, I would 100% recommend Vue. Vue is WAY simpler than react and angular. The documentation is amazing. It is extremely fast. The library is only getting more popular and will have more and more support. I am transitioning from angular to vue in my app, and I couldn’t be happier. Being able to use HTML templates instead of JSX makes a HUGE difference in productivity. Vue is also smarter than react out of the box. Vue is fast, simple, and mature (it’s on version 2 now). Also the fact that react is backed by facebook isn’t important. For example AngularJS was backed by Google, but they stopped developing it anyways and use angular 2 now which is completely different. Vue is used by so many companies that there is no way development will stop, even if the founder quits. Here’s my current thinking. I really want to use Bootstrap for various reasons, so that’s one fixed requirement. I also really want to use Meteor. Everything else needs to fit that (partial) stack. Here’s my current conundrum, which could sway the React/Vue decision. With Bootstrap as a fixed requirement, I’d probably end up using the react-bootstrap library with React or bootstrap-vue with Vue (I appreciate there are others, but these appear to be the leading - read better supported and tested - options). One issue here is that react-bootstrap only supports Bootstrap 3, whereas bootstrap-vue supports Bootstrap 4 (they’re working on it, but due to resources it is not expected to be available soon). Is using a 2+ year old version of Bootstrap a deal-killer? Probably not, but it’s a bit too early to say for sure and I’d hate to find out after several months of dev work. On the face of it, the improvements in v4 seem pretty cool (in particular it is lighter weight, uses Flexbox, has improved grid, and has moved from LESS to SASS). Given the choice, I’d go v4 (and just took a quick course in it). So, the more current Boostrap library is a big plus in favor of Vue for me. On the other hand… I do envisage building a mobile app for this project, so React Native is a big plus for React. True, Alibaba is working on Weex to allow Vue to run native and that could change things here, but that’s also not ready for primetime yet. … we see a huge difference in favor of react-boostrap (reflecting the downloads for vue vs react). So, here’s another area where the size of the ecosystem plays a significant part. I have to give credit to the developers of both libraries though for the quality of their docs. As someone who is new to the stack (with the exception of Node.js), having a larger ecosystem in React makes me feel more comfortable in terms of quickly finding support. Especially as I then start to add further important libraries for Bootstrap, which have the same ecosystem size consideration. I’m remaining agnostic for now, and am continuing to look more into the differences in the Bootstrap libraries (which is causing me to investigate Vue further). If anyone has feedback they could provide on using these, and with Meteor in particular, that would be super helpful!